David Hirsch was a visionary who planted one of the first vineyards in the true or West Sonoma Coast in Cazadero, which lies in the new Fort Ross/Seaview appellation. 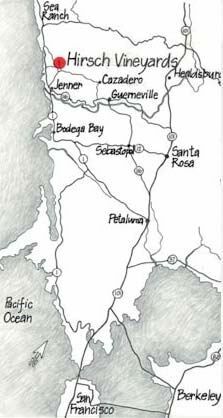 In 1978, Hirsch purchased 1,100 acres on a remote ridge 900 feet above the Pacific Ocean at the end of Bohan-Dillon Road. Beginning in 1980, he began the first two-acre planting of what eventually would encompass 68 acres of Pinot Noir and 4 acres of Chardonnay on ridge tops above the fog line a few miles inland from the Pacific Ocean. The vineyard became world-renowned when Burt Williams (Williams Selyem), Ted Lemon (Littorai), and Steve Kistler (Kistler) showed up one day in the early 1990s, chose their blocks, and started making exceedingly good and age worthy vineyard-designate Pinot Noir from the Hirsch Vineyard. 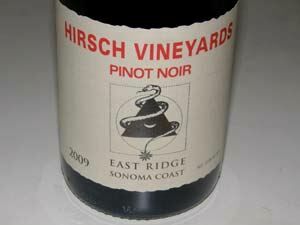 The name, Hirsch Vineyard, quickly became synonymous with the true Sonoma Coast as Hirsch’s vision gathered increasing validation with the arrival of many other prominent Pinot Noir producers who followed his lead. The Cazadero area is a coastal rainforest (rainfall averages eighty inches annually) with a desert-like climate in the summer. The climate is very unpredictable, with wide swings in temperature, wind and storms. The vineyard is scattered over several ridge tops with varying exposure, altitude and soil type (mainly sandstone-based), and there are a variety of rootstocks and clones (114, 777, Pommard, Swan and Mt. Eden) planted. The Pinot Noir plantings are divided into old vineyards (planted between 1980 and 1998) and new vineyards (planted in 2002 and 2003, with some replanting in 2007 due to phylloxera). The result is considerable heterogeneity to the fruit, so Hirsch Vineyard Pinot Noirs from different producers are difficult to compare. Chardonnay planting started in 1994 with cuttings from Joe Rochioli. Additional plantings ensued in 2002. The first estate Chardonnay was produced in 2006. Refer to the Hirsch Vineyards website at www.hirschvineyards.com for a precise delineation of all the vineyard blocks at Hirsch Vineyards. The photograph below was taken over the Hirsch Vineyard and demonstrates the varied topography. 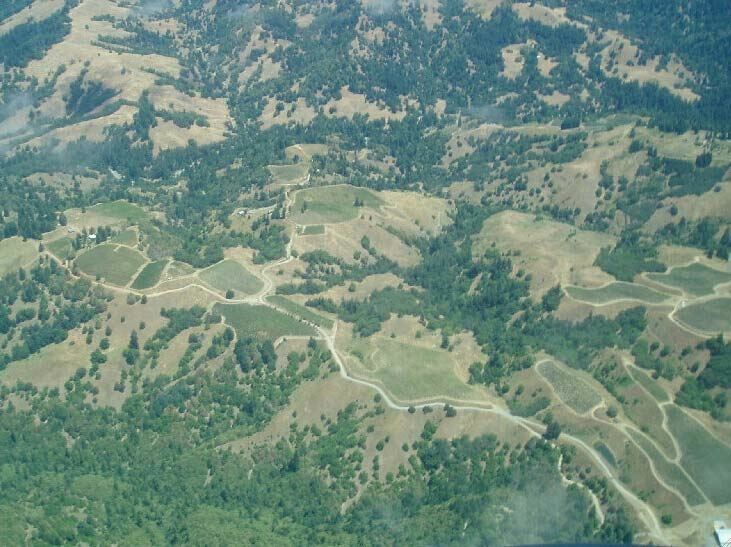 The ridge formations are a prime result of the San Andreas seismic fault that lies between Hirsch Vineyards and the Pacific Ocean with the fault influencing the climate as well. Beginning with the 2007 vintage, Hirsch Vineyards Estate Pinot Noir is labeled “San Andreas Fault” to emphasize the importance of this seismic fault in the character of Hirsch Vineyards wines. In 2002, Hirsch built a 15,000-case winery on the estate in an old lambing barn, and brought in winemaker Vanessa Wong (now the winemaker at Peay Vineyards) to craft the first Hirsch Estate Pinot Noir (vintage 2002). She vinified two vintages and was replaced by Mark Doherty (formerly of PlumpJack and Davis Bynum), who crafted the 2004 - 2009 vintages. He left in December 2009, replaced by Ross Cobb (also of Cobb Wines). Cobb blended the 2009 wines and 2010 was the first vintage he crafted from beginning to end at Hirsch. Since Cobb worked with Hirsch grapes while making wine at Williams Selyem and Flowers he is considered a total denizen of the Hirsch property. 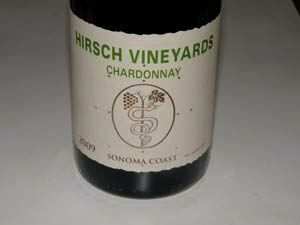 Current production of Hirsch Vineyards Pinot Noir and Chardonnay is about 5,500 cases annually. Grapes are sold to many prominent California wineries including Faille, Lioco, Littorai, Siduri and Williams Selyem. Everado Robledo has been the Hirsch Vineyards’ vineyard manager since 1988. He first grafted two acres of Riesling over to Mount Eden clone of Pinot Noir on the Hirsch property and never left. He lives on the site and planted all 90,000 vines on the 72 acres of Hirsch Vineyards. 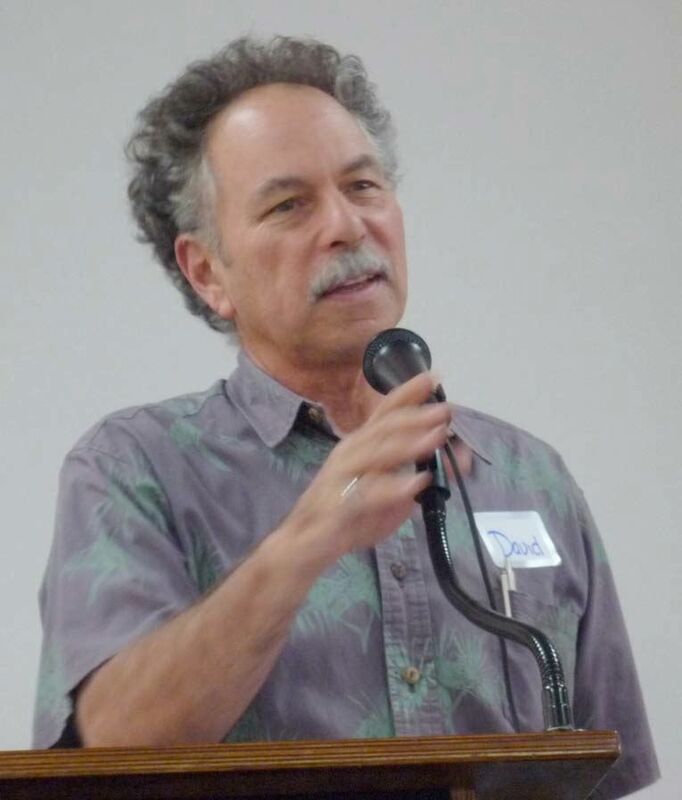 He is one of eight Robledo brothers who have played an important role in the development of vineyards and wineries in both Napa and Sonoma counties. 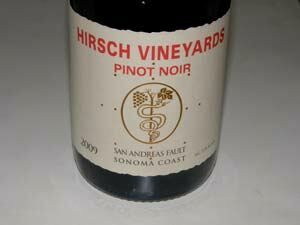 Refer to previous issues of the PinotFile for reviews of the 2002 and 2003 vintages of Hirsch Vineyards Pinot Noir and previous vintages of Hirsch Vineyards Chardonnay. Besides the estate Pinot Noir, Hirsch Vineyards offers the Bohan-Dillon Pinot Noir which is composed of barrels that are not included in the vineyard-designate estate bottling. It is a more casual wine, drinkable young and a very fine value. It is more available through distribution to several fine wine retailers. The 2009 vintage of Bohan-Dillon Pinot Noir was reviewed in the PinotFile (Volume 9, Issue 2). The Hirsch Vineyard Estate wines are sold primarily through a mailing list with very limited retail distribution. The 2009 vintage of Hirsch Vineyards limited bottlings of “East Ridge” and “West Ridge,” Pinot Noir and Hirsch Vineyards Chardonnay are sold out, but the 2010 vintage of these wines will be offered in the spring of 2012. The 2009 Hirsch Vineyards “San Andreas Fault” Pinot Noir is still available in 750 ml and 1.5 ml formats. 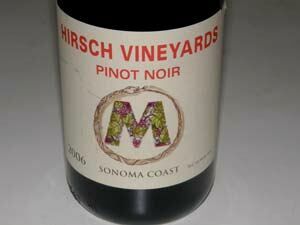 Hirsch Vineyards Pinot Noir is very distinctive. The wines tend to be darker fruited and savory with a good, sinewy tannic backbone reflective of the harsh growing conditions. They are definitely earth-based, terroir-driven wines. The 2004 and 2005 vintages are more rugged, particularly earthy and in need of aged beef or cheese accompaniment to neutralize the tannins which are mildly astringent, fine-grained and significant. The 2006, 2007 and particularly the 2009 wines are more nuanced, elegant and charming with more restrained tannins. Hirsch Vineyards is closed to the public, but visitors with advance appointments are welcome for private tours. The property is about a ninety minute drive from Santa Rosa and Healdsburg and should be undertaken in good weather due to the circuitous and narrow roads. Visit the website at www.hirschvineyards.com for more information. 14.3% alc.. · Dark reddish-purple color in the glass. Ripe aromas of black cherries and wild berries with hints of leather, clay, seasoned oak and rose petals. Moderately intense and bordering overripeness, with a core of black cherries, black raspberries, poached plums, black currants and raisins, and some oak in the background. Very tasty with mildly firm tannins and a crisp finish. The ripest of the 2004-2009 vintages. Starting to turn the corner and the only wine tasted in this lineup that was showing age. Drink up. Good. 14.1% alc.. · Darkly colored in the glass. An oak-driven nose offering aromas of brier, coffee bean and toast. Earthy, savory and rugged, with black plum and darker berry flavors, accented by oak, finishing with admirable persistence of slightly tart black cherries. A masculine expression of Pinot Noir that is holding its own. Good (+). 14.5% alc.. · Moderate reddish-purple color in the glass. Aromas of dark pie cherries and oak vanillin. Nicely flavored with an array of fruits including black cherries, dark red raspberries and currants and a riff of oak and cola in the background. Well-managed tannins add support and perky acidity provides a refreshing tone. This wine aims to please and is drinking beautifully now. Very good. 14.9% alc., 448 cases. A middle cuvée of the Hirsch Vineyards site from 22 blocks. · Moderately light purple color in the glass. This wine offers an appealing elegant bent with vivid flavors of fresh red and black fruits, especially cherries, set off by oak spice. The fruit really impacts the mid palate with attention-getting force and lasts forever on the big finish. Very good (+). 14.0% alc.. · Moderately light reddish-purple color in the glass. Aromas of dark red stone and berry fruits with accents of oak, malt and coffee bean. Veers to the redder fruit spectrum with moderate intensity. A refined wine with well-managed oak and tannins, and a lively, grippy finish effusive with cherries and oak. I suspect this wine will continue to improve over the next few years. Very good. 13.7% alc., pH 3.50, TA 0.63, $60. Hirsch Vineyards’ signature Pinot Noir representing the entirety of the vineyard. The fruit is sourced from 21 distinct farming blocks within Hirsch Vineyards. The 2009 vintage was remarkable for its coolness and evenness of weather throughout the growing season. Aged 17 months in 35% new French oak barrels. · Moderately dark reddish-purple color in the glass. The nose evolves slowly in the glass, revealing enticing aromas of berry pie, spice and musk. Delicious essence of black plums and black raspberries with a wild, untamed quality. Relatively delicate on the palate, yet the fruit really pops and coats the mouth for at least a minute on the finish. Seamless, with undeniable charm. 12.9% alc., pH 3.48, TA 0.67, 127 cases, $85. A limited production bottling from three exceptional hilltop blocks on the West Ridge of the Hirsch Vineyard covering 28 acres and divided into 27 farming blocks. This bottling is a selection of the most exceptional barrels from these blocks. Dominated by Mt. Eden clone with a dash of Swan clone. Aged 17 months in 35% new French oak barrels. · Moderate reddish-purple color in the glass. Exotically fruited, with a panoply of fresh, dark berry aromas underlain with scents of oak and underbrush. Pleasing core of dark berry and plum fruit wrapped in moderate tannins with a citric peel acidity in the background. Develops more vivacious fruit over time in the glass indicating cellaring is warranted. Very good. 13.8% alc., pH 3.46, TA 0.66, 160 cases, $85. A limited bottling from three of the oldest blocks on the East Ridge of the Hirsch Vineyard comprised of 18 acres and 16 farming blocks. Dominated by Pommard and Mt. Eden clones, this bottling is a selection of the very best barrels from these old blocks. Aged 17 months in 35% new French oak barrels. · Moderately dark reddish-purple color in the glass. Alluring aromas of black cherries and spice. Impressive rush of earth bound black cherry and dark berry fruit on the mid palate, persisting on the long and expressive finish. The mild, sinewy tannins add support and well-honed acidity adds vibrancy. Plenty of character in this wine and in my opinion, the best expression of Hirsch Vineyards Pinot Noir among the wines tasted here. I had some wine left over after tasting the following day, my wife took the wine as a gift to her hairdresser who loves Pinot Noir, but mistakenly left it in the trunk where it stayed for three days. When I retrieved it, five days after opening, it was still fabulous! Built for the long haul and an exceptional Sonoma Coast treasure. 14.0% alc., pH 3.32, TA 0.63, 725 cases, $75. Four vinification processes: fermented and aged on glass, oak and stainless steel and fermented on stainless steel and aged in oak. All four components were blended and racked to mostly neutral French oak barrels 9 months before bottling. · Medium golden straw color in the glass. Beautifully perfumed with scents of pear, lemon curd, bark, roasted nuts and honey. Delicious spectrum of flavors including pears, baked apples, and creme brulee with a striking aciddriven minerality on the back end. Medium weighted richness with a very smooth texture offering exceptional freshness and refreshing acidity. I have had some stunning Chardonnays from the Sonoma Coast of late and this one may take the cake.